Aberdeen were held to a goalless draw by St Johnstone in a frustrating afternoon for Dons supporters at Pittodrie. 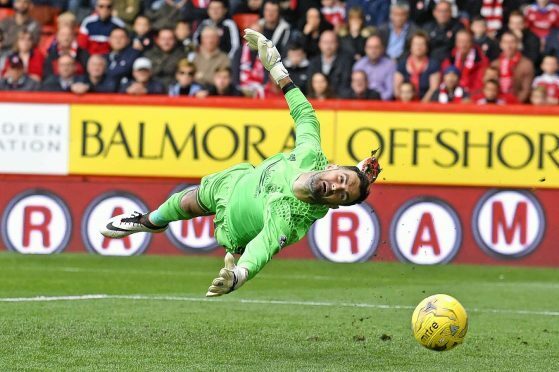 In a game of few chances the Dons were left thanking Joe Lewis for a superb save to earn his side a share of the spoils. The Dons made one change to the side which beat Kilmarnock 5-1 on Tuesday with captain Ryan Jack returning in place of Shay Logan, who dropped to the bench due to a foot injury. St Johnstone made one change to the starting 11 which beat Caley Thistle last weekend with leading scorer Danny Swanson missing out due to a hip injury. His place in the side was taken by Chris Kane. There was little between the teams in an uneventful first half featuring two well-matched sides. Murray Davidson fired wide from a cross from Steven MacLean for Saints before the Dons squandered their best chance of the opening 45 minutes when Andy Considine headed James Maddison’s corner over the crossbar. Logan and Jayden Stockley replaced Niall McGinn and Peter Pawlett at half-time as the Dons pushed for a breakthrough goal and they went close through Jonny Hayes who saw his right foot effort from the edge of the box saved by Zander Clark in the Saints goal. Stockley saw a header from a Maddison corner saved by the Saints goalkeeper as the Dons briefly threatened to make a breakthrough but it was the visitors who came close to an opener with MacLean seeing his long range strike tipped over the crossbar by Joe Lewis before substitute Blair Alston fired wide after intercepting a poor pass back from Graeme Shinnie. In an tense finale Lewis made an excellent save to tip a David Wotherspoon free kick on to the post to prevent the visitors from leaving with all three points.